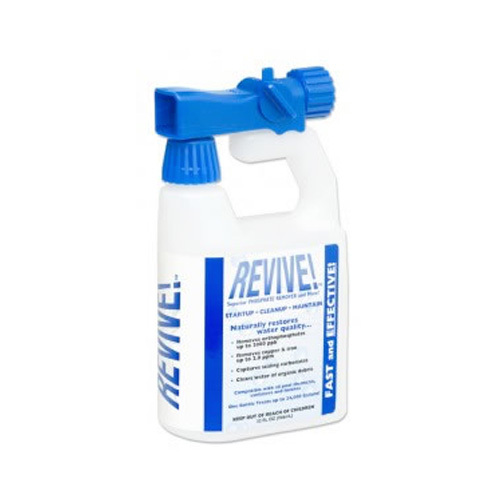 REVIVE!TM is a multi-action product that removes phosphates (algae food), metals including copper and iron, scaling carbonates, organic debris and other contaminants that cause cloudy water. It is formulated for use on new pool startups, re-plaster I remodel I refills, spring openings, abandoned pools, severe algae cleanups and ongoing maintenance of all pools. REVIVE! does the work of several products – phosphate remover, metal treatment and clarifier. The swimming pool industry has progressed over the years with more efficient energy saving pumps, filters, and heaters. The industry has also progressed in water chemistry and sanitation processes that allow the use of less harsh chemicals while still properly treating the swimming pool water. We feel it is our responsibility to continuously search for products that deliver the highest quality at fair pricing for all our customers. The EZ Pool and Revive sanitation products have produced a visual clarity and soft water feel that is unmatched in our Industry. These products have taken the place of harsh chlorines and water balancing chemicals that damage our skin, irritate our eyes and contaminate our environment. The Pool Experts are committed to using these high quality products to enhance your swimming experience.